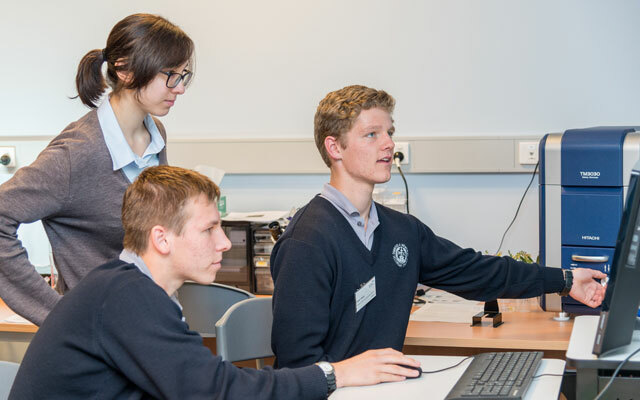 Year 10 and 11 students from rural areas in Victoria and Tasmania were introduced to the biomedical science disciplines at a program presented by the University of Melbourne and the Gene Technology Access Centre (GTAC) on Tuesday 13 September. Forty nine students from 16 schools met with post-graduate students from the School of Biomedical Sciences to learn about study pathways, available courses and life on campus. The students also learnt about Access Melbourne, a program that supports students from rural or regional areas in gaining entry to undergraduate courses at the university. Each year, 20 per cent of domestic undergraduate places at the university are reserved for Access Melbourne applicants, inclusive of students from financially disadvantaged backgrounds. 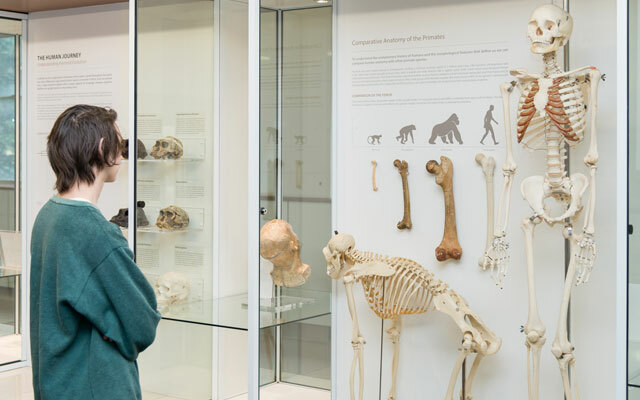 While undertaking a tour of the university, the students were granted entry to the fascinating Harry Brookes Allen Museum of Anatomy and Pathology, which has one of Australia’s largest collections of real human tissue specimens and historical anatomical models. 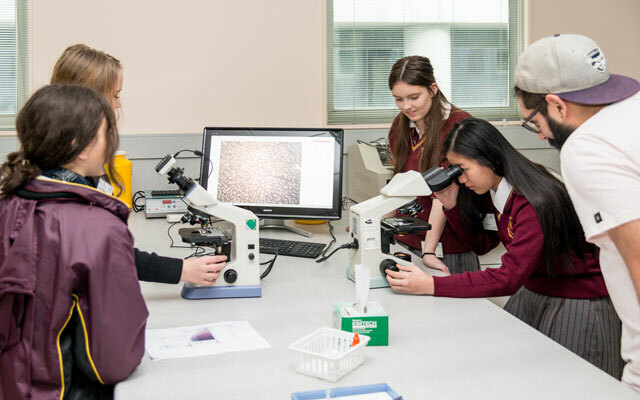 In the afternoon, students worked alongside post-graduate biomedical sciences students from the university in the GTAC laboratory to photograph specimens using light, fluorescence or electron microscopes as part of the ‘Under the Coverslip Biomedical Science Meets Art’ competition. Students then have two weeks to digitally modify their images and give them a creative title before submitting them for competition, showcasing the beauty of scientific imagery as well as the importance of research work. Award winning entries will be shown at the Biomedical Science School’s end of year celebrations. 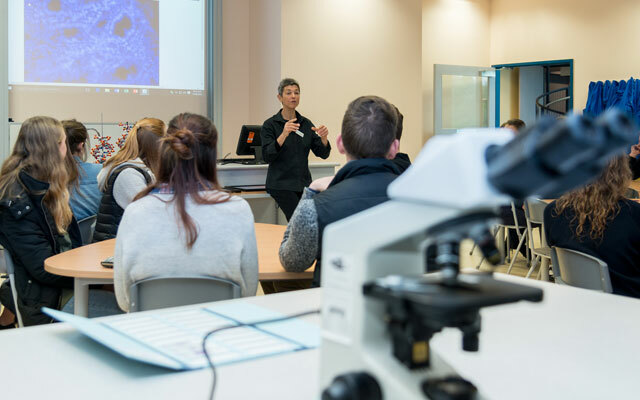 Phoebe – a year 10 student from Port Dalrymple School in George Town, Tasmania – thought the program was a very good introduction to biomedical science studies and described the event as an once-in-a-lifetime opportunity. “I didn’t see myself as a city person but I would now definitely consider studying here,” said Phoebe. Her teacher Moira Smith, herself a winner of the Young Biology Teacher Awards in Tasmania, wants to encourage promising young students such as Phoebe and classmate Tarlia to pursue studies and careers in science. “Events like this show students that there are interesting, relevant and bright futures in the areas of science, technology, engineering, arts and maths [STEAM], said Moira. Students attended the event from the following schools: Casterton Secondary College, Cathedral College, Portland Secondary College, Wallan Secondary College, Horsham College, Loreto College, Lowanna College, Dimboola Memorial Secondary College, Distance Education Centre Victoria, Emmanuel College, Colac Secondary College, Dromana College, Maffra Secondary College, Port Dalrymple School, Sherbrooke Community School, and St Thomas Aquinas College. The program will run again in 2017.